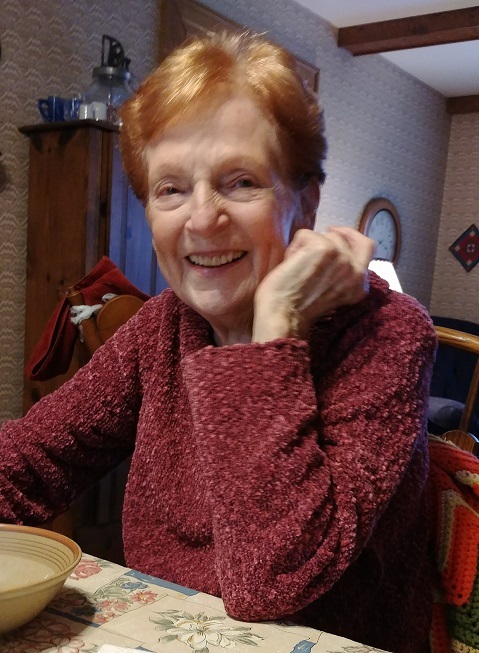 Our precious, adorable, fun-loving, classy and sassy mom, Nora Lavette Nicholson Moore, of Raymore, Missouri, passed away at KC Hospice House on the morning of March 23, 2019, following a brief illness. As a child, Nora accepted Jesus as her personal Savior and has a personal relationship with her Lord. So, Nora’s transition to Heaven is her welcome eternal reward. Nora was born on April 4, 1934, in Brownwood, Texas, to Ellis Ellwood Nicholson and Nanny Bell Cooley Nicholson. She has three siblings; Nell Virginia, Marion Elwood “Nick”, and Margaret Ewalda Nicholson. Nora and her precious sister Margaret are joined at the heart. Nora is the last of these original Nicholsons to leave this world behind. She was raised in a loving home where she remembers her mother getting tickled at silly things and her quiet, loving daddy being a steady, hard-working man. Although much of Nora’s childhood was during the Great Depression, she recalls a home where she did not know the extent of their poverty due to the way her parents stretched their meager resources. In May of 1954, Nora married a Yankee, Donald Dean Moore, in Brownwood, Texas, where they both attended Howard Payne College. Following Don’s graduation from college the day after their wedding, Nora and Don spent their "honeymoon" traveling with his parents in their car to move to Don’s home state--the foreign land of Kansas! Always a Texan, even recently she still would say, “I live in Missouri, but I AM A TEXAN!” Her Texas accent verified that fact. Nora loves her Texas bluebonnets. We think it is just perfect that her Texas bluebonnets are in full bloom back in Texas right now! Nora served alongside Don on his various church fields in Kansas and Missouri throughout Don’s ministry as a Baptist pastor until Don passed away in 2002. Nora always desired that folks get to know her first as “Nora” before they pigeon-holed her based on her husband’s vocation. That said, she loved and fully supported Don in everything he did. Nora has three kids: Jeff Moore (Marsha), Pam Ray (Mark), and Karen Rowland (Mark). Her kids-in-law run a very close competition with her birth kids for the loving place they all have in Nora’s heart. She is so proud of all of her kids and the life they each live. Nora was blessed with six grandkids and loves each one of them and the sweet and special times they each shared: Arianne Moore Felts (Joshua); Nicholas Ray (Christina); Tyler Ray (Ashley); Noelle Moore; Ashley Rosenbaugh; and Parker Rowland. Nora was more recently blessed with five great-grandkids and never missed a chance to see them so that she could play and laugh with them: Paytin Richardson, Braydin Ray, Fredrick Ray, Jaxin Ray, and Finley Ray. Nora and her sister-in-law, Beulah, have long treasured each other as they each married one of the ornery Moore twins--Nora and Beulah had to stick together! Nora has many nieces and nephews scattered from California, to Texas, to Kansas, and back to Missouri. Nora deeply loves her family and never missed a chance to let them know it--not only by her words, but in her loving actions toward them. At holiday family gatherings or on a day that Mom just made up a reason for us to get together, you could find us all hanging out around the table for hours after our meal--not wanting to break the magic of our time together as we swapped memories and shared laughter. What else to say about Nora? The first time she went to the movie theater, she saw the first run of the Disney classic “Pinocchio” and cried when Pinocchio went to Pleasure Island. And to say that Nora loves to sew does not do her justice. Making clothes for herself and her daughters; sewing drapes, pillows, and bedcovers; making blankets for grands and greats; altering garments professionally; taking in alterations for family, friends, and neighbors--Nora always kept her 1950’s era Singer Sewing Machine humming. She tried, but she never did wear out her machine! Nora is an artist and loves to paint. She went to water aerobics classes several times a week until recently. Nora enjoys getting together with a group of cherished friends; visiting with her dear next door neighbors; having a cup of coffee with close friends or enjoying a cup of coffee by herself in the afternoon. Nora loves to cook her style of good home-cookin’ and makes a mean Mexican casserole that we all loved for her to serve. Every spring Nora announced that she would not put out on her patio the many hanging plants and pots of annuals which she is known for. “It’s just too much.” BUT, every year by early summer, Nora had filled her patio with “just one more” gorgeous flower. Nora can hula hoop--a few years ago in Academy Sports when she was trying out a new hula hoop in the aisle, a young guy walked by, watched Mom hula hoop, and said, “IMPRESSIVE.” Yes, she is. We will all miss our mom, Nora Moore, and it will be so difficult without her here on earth. But as she said, “I’ve lived a good life.” We are the people we are because of our precious Mom. Visitation 9AM, service 10AM, Saturday, April 6 at Park Lawn, 8251 Hillcrest Rd. ; burial in Mt. Moriah Cemetery. Memorial contributions to Kansas City Hospice House, 12000 Wornall Road, Kansas City, MO 64145. Visitation 9AM, service 10AM, Saturday, April 6 at Park Lawn, 8251 Hillcrest Rd. ; burial in Mt. Moriah Cemetery. With deepest sympathies ... Wrapping each of you in warm & comforting hugs. What a sweet tribute to a sweet lady. You are all in our thoughts and prayers! I had the pleasure of knowing Nora. She was one of a kind. She will be missed by all who knew her. My deepest sympathies and prayers are with the family. I will miss teasing that little red head that was in front of me in the pool. She was so funny. So sorry to see that Nora has passed on but we can be assured that she is in a better place with Jesus and Don. Knew her and Don from LVBC. Our prayers go out to her family. As one of Nora's Bunco friends, and also from water aerobics, I can tell you she will be sorely missed. She was always a delight to be around. I am so, so sorry for your loss. I will miss her too. ..and sassy and classy is a really good way to describe her! Our deepest sympathies to the family. While we didn’t know her, the write up proved how wonderful of a person she was. Mrs Felts, Remember you and your family are in my thoughts and prayers during this time. May the love of family and friends comfort you during these difficult days, my most heartfelt condolences. I am so terribly sorry for your loss. Clearly she was a fabulous woman with big shoes to fill. So many of those lovely qualities shared in her obituary I totally see in you Arianne. You are in my thoughts and prayers.